Warning: There is no point ahead. I had a really good hair day Sunday and I really wished Seth Roberts from middle school was there to see it. He always got endless amounts of enjoyment by tormenting me. And, it’s probably wrong, but I would love to run into him and find out that he is bald and overweight and I would say, Oh, yeah. Who’s the ugly one now, buddy? Okay, so that would not be very Christ-like and I probably would not do it out loud anyway. And, I was feeling particularly snazzy because I was wearing my skinny jeans. And, by skinny jeans, I mean the ones that make me feel skinny. Not the skinny jeans because, seriously, who wears those? I have no idea where I’m going with this…we could really end up anywhere. 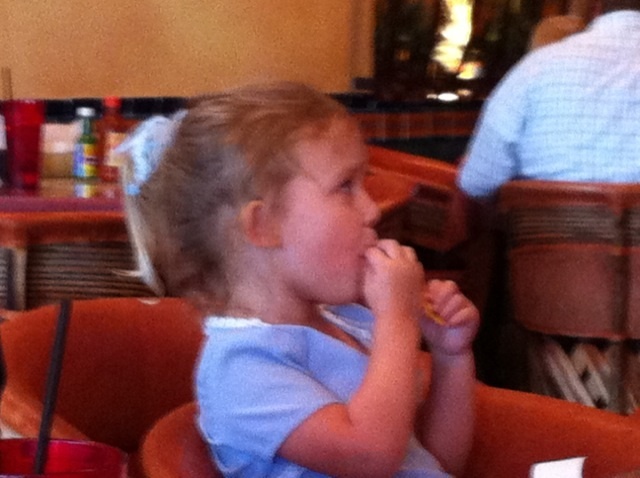 I love this picture of Ella. It’s a little blurry, I know. After church on Sunday, we went to my favorite little Mexican restaurant with some friends. We caused a bit of panic for the little guy at the door when we said there were fifteen of us. Quince? Si, quince. So, while we are all chatting it up and making a ruckus – Ella is chomping on chips and salsa and watching the Titans on the big screen. 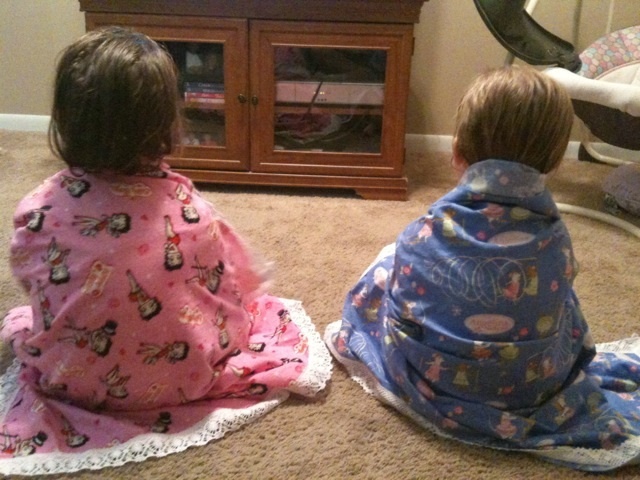 My girls love these new blankies made by my husband’s Aunt Nancy. And now…a word from Sarah. Love the video of Sarah. She and Josiah could carry on a conversation with each other. 🙂 By the way, your hair did look good on Sunday. I’m getting my hair done on Friday. I’m going to try a new place. I’ll let you know how it goes.